In this basic project, we will create a simple LED circuit on a breadboard. 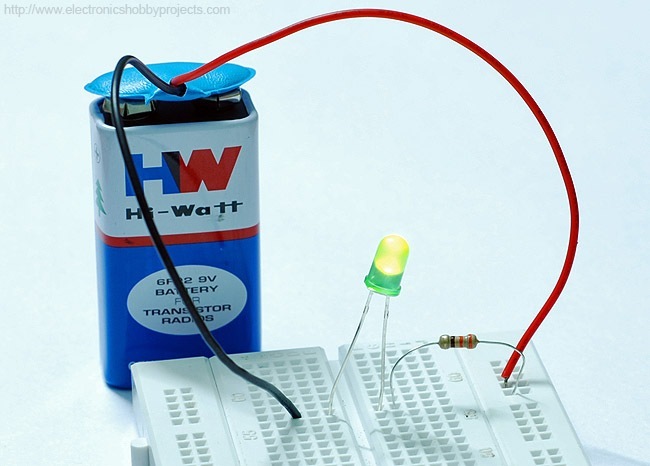 This is a good project for the beginner as it will give experience in hooking up components, using a breadboard properly and also will demonstrate how an LED works in a circuit. We will use a 9v standard battery to power the LED. 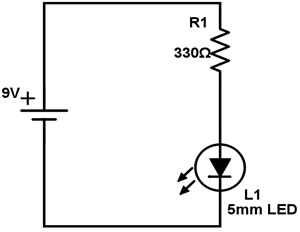 Since LED has limited resistance above its rated voltage of 2V, we need a current limiting resistor in the circuit. LED lights have a long leg and a short leg. The long leg should be connected on the positive side of the battery so that the current flows from long leg to the short leg through the LED. How this Simplest LED Circuit Works? LED lights usually are designed to light up at a fixed voltage around 2V. The exact value of this voltage varies depending on the light of the LED light. Any further increase in this voltage will lead to high current if there is no limiting resistor. LEDs can handle a current range around 20mA safely. So we should put a resistor in the circuit that will ensure 2V drop and a safe current value of 20mA. How do we find the resistor value? The equation for resistance is Resistance = Voltage/Current. Since LED already has 2V drop, our resistor should have a 7V drop with 20mA current across it that the LED can handle. Hence resistance we need is 7/0.02A = 350 ohms. Hence I have used a standard resistance value of 330 ohms which will ensure a current slightly above 20mA. Note that we are not looking for precise values. We just need to ensure that the current is enough to light the LED and at the same time should be around the 20mA safe range. I have hooked up the simplest LED circuit on a breadboard (see picture below). The wiring uses the same layout as given in the above circuit diagram. The longer leg of the LED is on the right side. If you want to see changes in LED brightness with changes in current, you can use a 1K potentiometer instead of 330 ohm resistor. First set its value highest and then reduce it to light up the LED.